Ever want to make sure your Internet browsing is completely private from prying eyes? With this special offer from Kepard, you might win access to their VPN service for 3 months at no charge! A total of 3 winners will be selected to receive this great prize. It consists of a premium account, which means that you can use Kepard's service without worrying about bandwidth limitations. That means that you can stay on the VPN all the time, enjoying the peace of mind that comes with surfing the Internet completely protected from people who might spy on you. A VPN service provides you with the ultimate protection against having your privacy breached. It encrypts your traffic so that it cannot be intercepted and read by hackers, your ISP or government agencies. This is a great feature for those who are tired of feeling like they're always being watched online. Kepard offers VPN services servers located in some of the most desirable nations. If you want to watch content on the Internet that is restricted to specific nations, there's a very good chance that you can log in from one of those nations on Kepard's service, opening up new content for you. Convenience is only part of what you get, however. It's really about privacy. With Kepard's VPN service, you can be sure that your traffic is always protected from anyone trying to see what you're doing, what you're looking at or who you're talking to. It's great for business and personal use because of this. You may well want to sign up after your 90-day free prize! If you want to be one of the 3 lucky winners, the process is easy and fast. 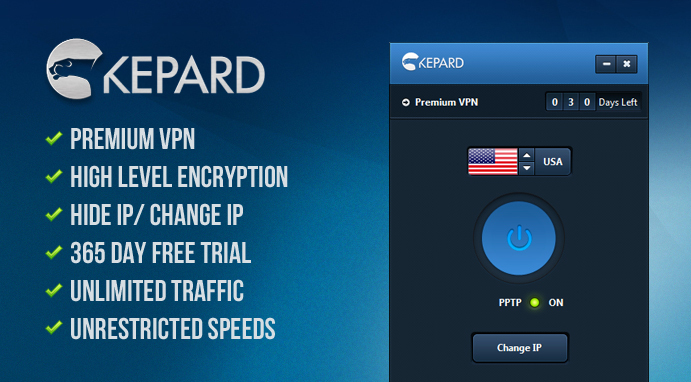 Tweet this contest, like this: "Giveaway: 3 Premium VPN Accounts for Free from Kepard.com http://bit.ly/13JWLjP via @btipandtrick" then leave a comment below (with your valid email address) including your tweet link. We’ll pick 3 lucky readers and announce the results on Saturday March 16, 2013. Good luck to everyone joining this offer and keep checking back to see who won! You are selected as the winner of this contest. You will be contacted with the information how to get the prize. Thanks for this offer. I am also in the queue. Oh! Got my name in winners! Thanks. Waiting for your further mail.